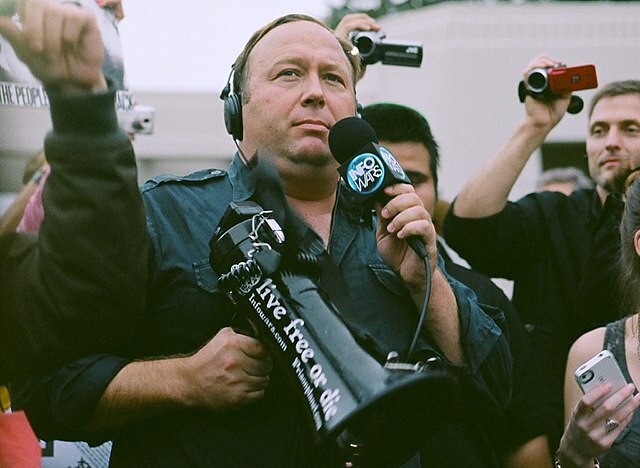 Alex Jones and his website Infowars have been the subject of multiple defamation lawsuits over his repeated claims that the 2012 shooting at the Sandy Hook Elementary School in Newtown, Connecticut was a “giant hoax.” Jones and Infowars continued to make these claims on broadcasts and in articles published on his website over the course of many years. Jones’ followers have harassed the families of the victims and many, in turn, filed suit against him for making defamatory statements that were knowingly false, or made with a disregard for the truth. For news, analysis & additional materials read on. First Amendment Watch Teaching Guide: Can First Amendment Defenses Save Provocateur Alex Jones From The Sandy Hook Libel? During a three-hour long taped deposition as part of a defamation case brought by some of the families of the Sandy Hook victims, Alex Jones claimed he had a “form of psychosis” that caused him to question whether certain events like the Sandy Hook mass shootings were staged. “And I, myself, have almost had like a form of psychosis back in the past where I basically thought everything was staged, even though I’m now learning a lot of times things aren’t staged,” Jones said in a video released by Kaster Lynch Farrar & Ball LLP, a Texas law firm representing some of the families. Jones blamed the “the media” for leading him to distrust everything. Jones also acknowledged that some of his reporting was based off of Internet sources like YouTube and 4Chan. Regardless, Jones would not admit that his conspiratorial claims caused the families pain, and described the lawsuits as an attack on him and on the First Amendment. The New York Times reports on a series of legal victories in favor of the Sandy Hook families in three lawsuits against Alex Jones and Infowars. In Texas, a judge ordered Jones and Infowars representatives to submit to questioning by the lawyers of one Sandy Hook mother, and also granted access to the company’s business records against the wishes of Jones’ lawyers, who wanted them to remain sealed. In Connecticut, a judge ordered Infowars’ business associates and partners to testify, and will soon rule on the deposition of Jones himself and other Infowars associates, as per the families’ request. The six families suing Alex Jones and Infowars in Connecticut over repeated defamatory comments about the Sandy Hook Elementary School massacre were granted a legal victory in their case. The judge ruled that the families can gain access to Infowars’ financial and marketing documents, contracts between Infowars and platforms like Facebook and Twitter, and any communications including letters, emails, and text messages related to Sandy Hook, Adam Lanza, crisis actors, or mass shootings. According to an attorney for the families, this documentation is meant to corroborate the claims made in the lawsuit to prove that Alex Jones is a “conspiracy profiteer.” The judge will decide whether to let the plaintiffs’ legal team depose Jones at a hearing scheduled for this week. Lawyers representing the families of two Sandy Hook shooting victims accused Alex Jones of intentionally destroying evidence related to the lawsuit. According to the motion filed, Jones said on his broadcast that he instructed his staffers to delete select content like social media messages and videos, some of which was considered evidence in the Sandy Hook case. The judge has 30 days to rule on a motion to dismiss the case. In an attempt to dismiss a defamation lawsuit, Alex Jones of Infowars compared himself to Carl Bernstein and Bob Woodward, The Washington Post journalists who helped uncover the Watergate scandal, saying he acted like a journalist when he questioned the narrative of the Sandy Hook school shooting in 2012. In a phone interview, defense co-counsel Marc Randazza told the Connecticut Law Tribune that should the lawsuit go forward, it “could stifle investigative and critical reporting,” and that the families of the shooting victims were not defamed. The lawsuit claims that while Jones’ false accusation brought him attention and business, the plaintiffs suffered personal pain and abuse from the radio and internet personality and his fans. The New York Times reporter Elizabeth Williamson writes that Jones claims First Amendment protection for his work and that the most recent lawsuit filed challenges that defense. “The First Amendment has never protected demonstrably false, malicious statements like the defendants’,” it reads. The 2012 Sandy Hook school massacre which killed 20 children and 6 adults galvanized parents and relatives of those murdered to promote gun reform. One conservative commentator who responded negatively to their efforts: Alex Jones and his Infowars which ran segments claiming the massacre at Sandy Hook was “a giant hoax.” Jones’ followers have continued to harass Sandy Hook families. Now Leonard Pozner and his former wife, Veronique De La Rosa, parents of Noah Pozner, and Neil Heslin, the father of Jesse Lewis, have responded by filing two defamation suits against Alex Jones stating “defendants’ defamatory statements were knowingly false or made with reckless disregard for the truth.” They are seeking at least $1 million in damages. This is the second time this year Alex Jones has been sued for defamation. In March, Brennan Gilmore sued Jones for stories that led to threats against him. July 24, 2018: Are There Actual Constitutional Concerns In Jones’ Lawsuit? Charles P. Pierce writes in Esquire that the case contains may test the constitutional limits of talk radio, punditry, and extreme internet broadcasting. He also makes note of the other fringe figures that have been represented by Jones’ legal team in the past. Below are a select few instances in which Jones and Infowars contributors made claims to support the Sandy Hook shooting conspiracy theory on broadcasts and in published articles over the course of many years. In March 2014, Alex Jones began stating his allegation regarding a “fake” interview between Anderson Cooper and Noah Pozner’s mother, Veronique De La Rosa. The allegation that the interview took place in front of a “blue screen” became central to Jones’ assertion that the Sandy Hook school shooting was manipulated by the government and performed by crisis actors.